Generally, when I am working with growers on a problem related to potted-tree establishment, the cause is lack of water movement into the potted media, creating tree stress. This results from the difference in soil particle size at the boundary between the orchard soil and the tree's potting soil. When you plant a potted tree in your orchard, it has a substrate – some mix of peat and vermiculite – that is very different than your soil type. The change in texture and pore size inhibits water movement from the surrounding soil into the potting media. As a result, Irrigation water applied outside the potted soil media isn't getting to the roots. The sequence of photos in Figure 1 demonstrates this phenomenon. I set up a mock orchard condition with soil (Tehama series silty loam) next to a potted tree (potting soil) in a ½ inch wide frame. I then slowly added water to match the soil infiltration rate, similar to a drip emitter, approximately 4 inches away from the potting soil in the ‘orchard' soil. 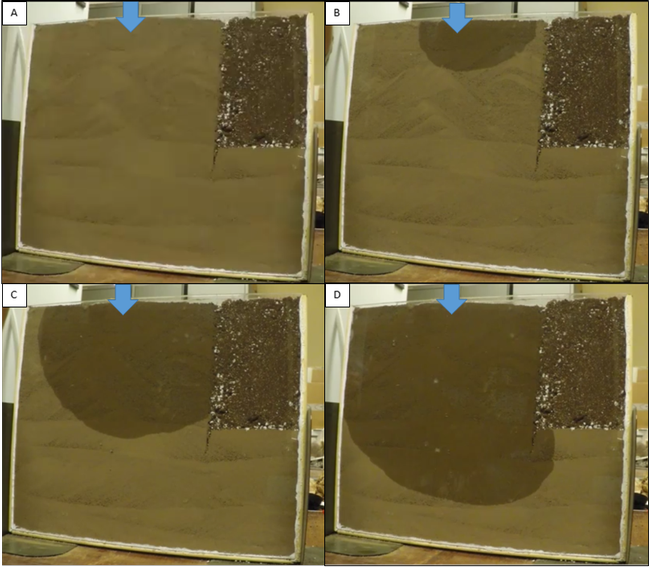 You will see that the water does not move into the potting soil (Figure 1C & D). Two forces – gravitational pull and capillary action – move water downward and laterally in the soil. Since the potting soil is not below the orchard soil, gravity does not move water into the potting soil. Capillary action is not strong enough to move water into the potting soil because the difference in pore size is too great. So, irrigation water goes where it can easily flow – downwards and laterally into dry, native soil but not into the potting soil. More water does not solve the problem, it will just move past your newly planted trees and wet more native soil. 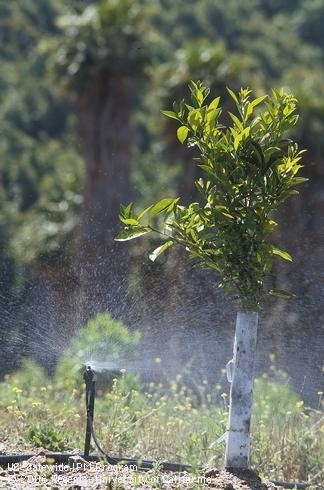 For about the first month of growth, irrigation emitters should be located at the base of the potted tree to ensure the potting medium receives water. Frequently check to ensure that the potting soil stays wet – not the soil somewhere else in the tree row or mound – before, after, and between irrigation sets. The best way to do this is with a small trowel and your hands. Water will need to be applied at the base of the tree until the tree roots grow beyond the potting soil and into your orchard's native soil. The time required for this to happen will vary depending on factors such as temperature, but it should take roughly a month. Figure 1. 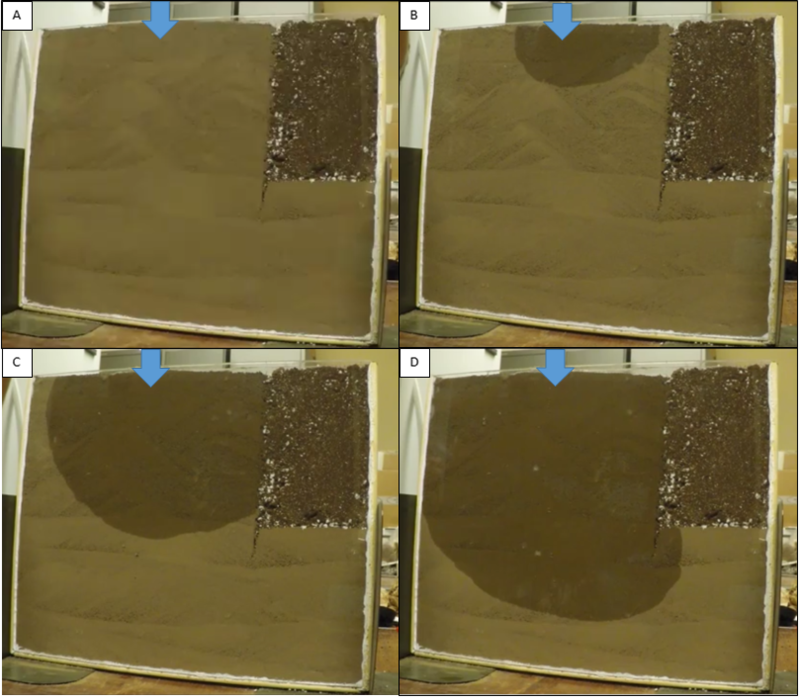 This sequence of photos shows the movement of water applied to Tehama series silty-loam soil. Water was applied at the blue arrow, approximately 4 inches from the potting soil. Total elapsed time was 51 minutes. Water moved downwards and laterally but did not cross the boundary into the potting soil. A recent letter which followed a farm visit to another grower and finally a phone call about planting an avocado tree from another grower. The basics of planting are often overlooked and we should revisit them to make sure we know how to do the basics. I am going to plant some avocado trees on a slope. I will be drilling a hole with an 18 inch auger about three feet deep. I have lots of wood chips from avocado trimmings. Should I mix some avocado wood chips with the soil to insure good drainage when I plant the new trees? Or should I mix in some compost to help good drainage? Some areas here have poor drainage because of clay soil. DO NOT put anything in the planting hole. It makes drainage worse. And if its not fresh the decomposing gases will kill the roots. And gradually over time, the organic matter decomposes and the tree sinks deeper into the ground, covering the graft union and the tree dies. I[m glad you asked. Someone is spreading the word that this is how to plant. It's a disaster if you do this. DON'T. You think you are doing everything right, but it is wrong. There's physics and biology involved and a good horticulturist knows better because of experience. Mulch applied to the soil surface is not the same as organic matter – planting mix put in the hole. And watch out for the auger. Especially in heavy soils, the auger can seal the sides of the hole, making an impenetrable surface to the roots. The sides need to be scrapped or scratched to make sure the seal hasn't been created. And don't go 3 feet deep. Go to the depth of the planting sleeve. 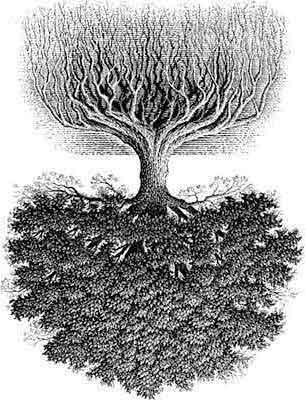 When you go deeper, the refill soil will compact and the root ball sinks, burying the crown. The avocado is a shallow rooted tree (most of the feeder roots are in the top 6" of soil) which needs good aeration. They do well if mulched with a coarse yard mulch. Current recommendation is to put approx 1/3 cu yd per tree when planting. When applying the mulch, be sure to stay about 6-8 inches away from the trunk of the tree. They like the soil pH around 6 - 6.5. If you can, plant your tree in a spot protected from wind and frost. Also, avocado trees typically do not do well planted in lawns so try to plant your tree in a non-lawn area. When should I plant my avocado tree? Avocado trees like warm ground. Ideally, they should go into the ground from March through June. If they go in during the summer there is always the risk of sun damage because the trees can't take up water very well when young. How big a hole should I dig? As deep as the current root ball and just as wide as the width plus a little extra so you can get your hands into the hole to plant it. Don't drop the tree into the hole, the roots don't like that, ease it into the hole. The avocado root system is very sensitive and great care should be taken not to disturb the root system when transplanting. If the tree is root bound, however, loosen up the soil around the edges and clip the roots that are going in circles. Should I put some gravel, crushed rock or planting mix at the bottom of the hole? No. Do not put gravel or anything else like planting media in the hole. The sooner the roots get out into the bulk soil, the better the tree will do. Planting mix creates a textural difference between the root ball and the bulk soil and causes water movement problems. Remember, there are 5 million acres of tree crops in California planted without planting mix. I have a heavy clay soil. Should I elevate the tree in a mound for better drainage? Yes, good idea. Make the mound 1 to 2 feet high and 3 to 5 feet around. Put down 20 pounds of gypsum spread around the base of the tree and mulch the area with 6 inches of woody mulch keeping the material about 6-8 inches away from the tree trunk. What do you mean by a "coarse yard mulch" and where can I get some? Redwood bark will work and maybe cocoa bean husks and shredded tree bark. Need something that is woody and about 2 inches in diameter. Coarse yard mulch is available at some garden supply centers. Be sure it is COARSE, not fine, yard mulch - and disease-free to prevent introducing diseases to your tree (like root rot). Another source of coarse mulch would be a tree trimming operation, like Asplundh or Davy. They usually have material that has been pruned from the tops of trees and doesn't contain any diseased roots. Just go through the yellow pages looking for tree services.